Cost – The early and obvious advantage of the digital organ was that it costs less to build and install than the traditional pipe organ. 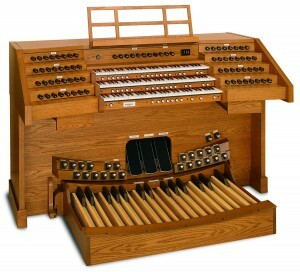 Maintenance – Unlike a traditional pipe organ, the digital organ requires no tuning—ever ! Furthermore, there is virtually no regular maintenance required and the owner is freed from the traditional pipe organ issues of aging leather (which is VERY costly to replace), rust, split wood parts, and the harmful effects of temperature and humidity fluctuations. Variety – While a pipe organ is limited to the sounds produced by the actual pipes mounted on the windchest, the latest Allen digital organs allow the organist to move from organ sounds of one period to another at the touch of a button. For instance, performance of a piece by Bach was written for a baroque organ and sounds best in the Arp Schnitger north German baroque mode………and a piece by Widor sounds best with the stops producing a late 19th Century French romantic mode. Both of the “modes” or settings are available on the latest Allen digital organs, along with five other settings (! ), something that is impossible on the traditional pipe organ. Technology—While technology is always moving and advancing, the science of sound storage has reached a plateau in recent years from which future sudden advances are unlikely. This should serve to preserve the value and relevance of the latest digital Allens to purchasers of these latest models. Reliability—Versus the pipe organ, the Allen digital organ is far more stable and reliable. There are no ciphers, spring and tracker malfunctions with the Allen…….AND……..in the event of a rare need for repair or maintenance, parts are always readily available. 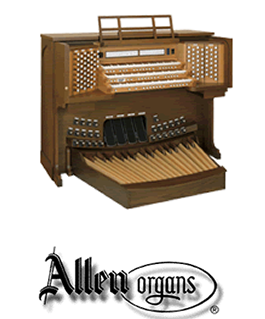 Allen continues to stock parts for every organ it ever manufactured meaning that the owner is never left unable to locate a required repair part. This is virtually unique in the digital organ field.